Venture out of the city with trips to Chichen Itza (The Ossuary, Chichen Itza, & more), Uxmal (Choco Story & Uxmal) and Hacienda Yaxcopoil (in Yaxcopoil). Spend the 9th (Sat) among aquatic life with a scuba or snorkeling tour. 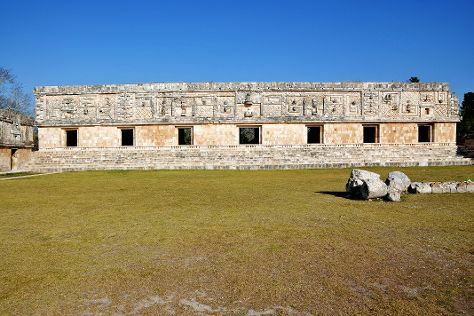 There's much more to do: admire the striking features of Paseo de Montejo, explore the ancient world of Mayapan Mayan Ruins, see the interesting displays at Gran Museo del Mundo Maya, and don't miss a visit to Uxmal. To find photos, reviews, more things to do, and other tourist information, use the Merida holiday website . If you are flying in from Canada, the closest major airport is Licenciado Manuel Crescencio Rejon Int Airport. In February, plan for daily highs up to 38°C, and evening lows to 22°C. Wrap up your sightseeing on the 26th (Tue) to allow time to travel back home.